In his 2018 letter to Berkshire Hathaway shareholders, Buffett wrote that stock performance converges with business performance over time if the original purchase price is not excessive. When we launched our quality dividend growth family of Indexes, we described the screening process as including a "Buffett factor" in stock selection. DGRW is currently valued at an 11% discount to the S&P 500 based on forward P/E, while our International and Emerging Markets Quality Dividend Growth Indexes are valued at a 19% premium and a 2% discount to their benchmarks, respectively. Warren Buffett views Berkshire Hathaway's (NYSE:BRK.A) (NYSE:BRK.B) stock portfolio as more than a basket of tickers. 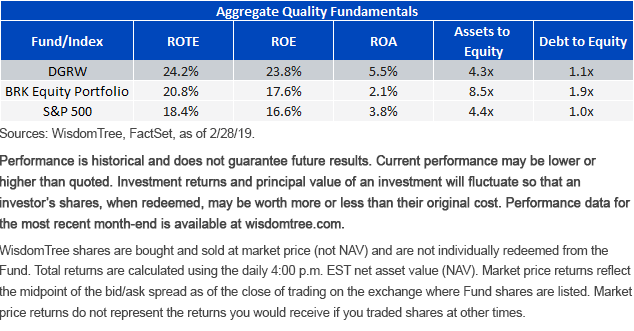 Return on equity (ROE) is a metric Buffett has written on extensively: it's a "quality" indicator for stocks, reflecting how much profit a business earns relative to its net equity capital. Buffett and his business partner Charlie Munger are known for saying, "It is far better to buy a wonderful business at a fair price than to buy a fair business at a wonderful price." The Indexes utilize both ROE and return on assets (ROA) as part of the selection requirements. Using ROA as a screening criterion penalizes firms using leverage to drive ROE. Buffett has been hoarding cash - he now has over $100 billion to put to work. He worries that market opportunities are limited because of rising prices and high valuations to complete full acquisitions. Yet, there is a basket of 300 U.S. listed stocks that offer similar fundamental attributes to his current collection of equity holdings. The WisdomTree U.S. Quality Dividend Growth Fund (NASDAQ:DGRW) invests in high-quality companies within the dividend-paying universe. We performed a quality check on our collection of tickers and compared it against Berkshire's equity portfolio. Based on Buffett's preferred measure of business performance, return on net tangible equity, DGRW has a higher level of profitability than Berkshire's latest equity portfolio. Also key to Buffett's investment model is his requirement that companies do not employ excessive levels of debt. DGRW's assets-to-equity ratio - a measure of how much of a company's assets are financed with debt and other liabilities - is significantly lower than Berkshire's portfolio. Berkshire's higher assets-to-equity ratio and lower ROE and ROA are driven by large positions in Financials which operate with higher levels of assets and liabilities than other sectors. At the time of writing, 9.5% of DGRW's weight is in the Financials sector. The key caveat to Buffett's argument that business performance converges with investment returns is that valuations must be reasonable. He explains, "On occasion, a ridiculously-high purchase price for a given stock will cause a splendid business to become a poor investment-if not permanently, at least for a painfully long period." DGRW is a fund that tracks the investment performance of a Dividend Stream weighted index, which means constituents are weighted based on their proportionate share of the aggregate cash dividends paid by the basket of equities. Dividend weighting anchors DGRW to a measure of fundamental value instead of price. The end result is DGRW's ability to tap into quality factors-which are typically expensive-without sacrificing on valuations. DGRW is a slightly more expensive than Berkshire's equity portfolio on estimated price-to-earnings (P/E)as well as price-to-book. This is driven by DGRW's under-weight allocation in Financial stocks, which tend to have lower return profiles and valuations. For investors seeking exposure to Buffett's style of investing, DGRW proves to be a top candidate. Buffett characterized current U.S. equity valuations as "incredibly" inexpensive relative to the 30-year U.S. Treasury yield of approximately 3%. He expects Berkshire to be a net purchaser of stocks in 2019 because he views companies earning returns on net tangible equity within the range of Berkshire's equity portfolio as "incredible in a world of 3% bonds." 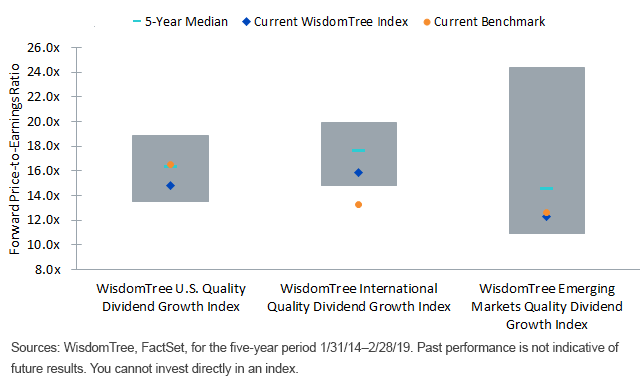 The WisdomTree U.S. Quality Dividend Growth Fund (DGRW) implements Buffett's investment approach in a more systematic and scalable fashion. With aggregate profitability that is comparable to Berkshire's equity portfolio and a valuation below the S&P 500, DGRW provides the exposure to high-quality, mid- and large-cap U.S. equities that could serve as the core in an investment portfolio. In addition, valuations for high-quality, dividend-paying U.S. equities are also favorable compared with their equivalents in other developed and emerging markets. 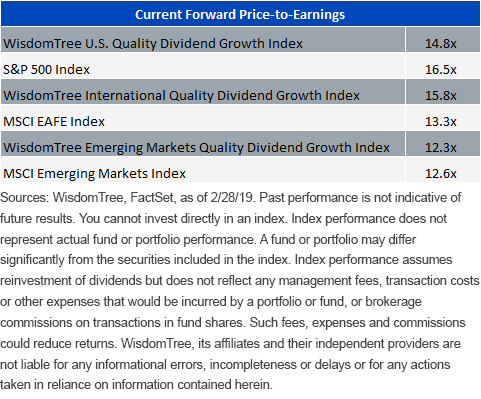 DGRW is currently valued at an 11% discount to the S&P 500 based on forward P/E, while our International (WITDG) and Emerging Markets (WTEMDG) Quality Dividend Growth Indexes are valued at a 19% premium and a 2% discount to their benchmarks, respectively (as shown in Figure 3). There are risks associated with investing, including possible loss of principal. Foreign investing involves special risks, such as risk of loss from currency fluctuation or political or economic uncertainty. Funds focusing their investments on certain sectors increase their vulnerability to any single economic or regulatory development. This may result in greater share price volatility. Please read the Fund's prospectus for specific details regarding the Fund's risk profile.